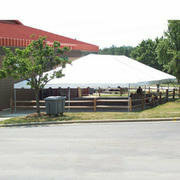 The 30 x 50 Frame tent will accomodate up to 125 people seated. The tent requires 34' x 54' for staking, This tent can be put on pavement but will require water barrels to secure. Price includes installation.